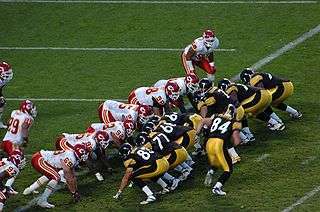 The Kansas City Chiefs (red) and the Pittsburgh Steelers (black) line up for a play on the goal line. The goal line is the chalked or painted line dividing the end zone from the field of play in American football and Canadian football. It is the line that must be crossed in order to score a touchdown. In the event of a kick recovered in one's own end zone, the entirety of the ball must pass the goal line in order for the ball to be considered a touchback, and to not be in the field of play. ↑ Ominsky, Dave; Harari, P. J. (1 September 2002). "Football Made Simple: A Spectator's Guide". First Base Sports, Inc. – via Google Books.